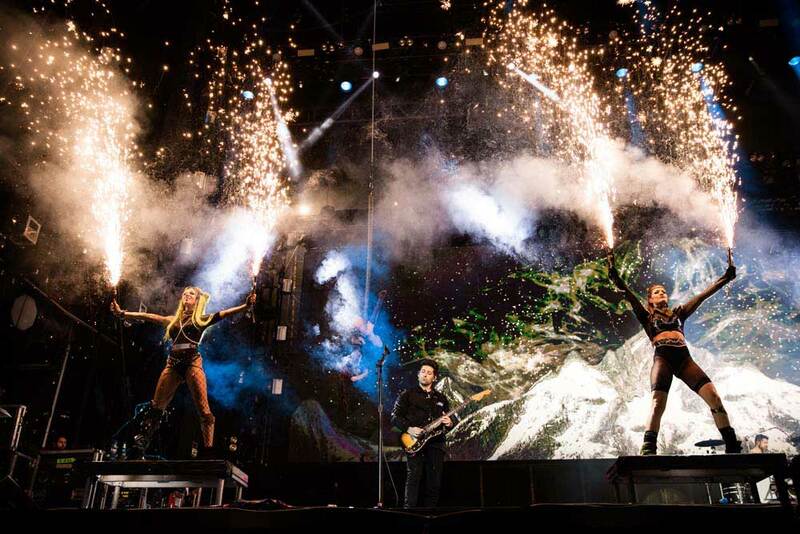 A Jands Vista console was at the heart of Fall Out Boy’s headline performances at the recent Reading and Leeds Festival main stages. The Chicago band have spent the past decade working their way up the festivals’ bill, and their strikingly visual performances on the consecutive nights, created by production designer Robb Jibson, garnered rave reviews in the media. Robb, who also helms Chicago-based So Midwest Inc which provided the Vista control package, has been touring extensively with the band, and the Leeds and Reading shows were the culmination of the 18-month American Beauty/American Psycho album cycle. The custom setup, which has accompanied him throughout, consists of a Vista S3 control surface run on OSX via two Mac Minis with stacking dongles, providing an active/backup system with the footprint of just one desk and a total of 16 cores of i7 processing. Robb also used a pair of Jands D1 processors on the network, which helped distribute the load – a parameter count of just over 17,000. 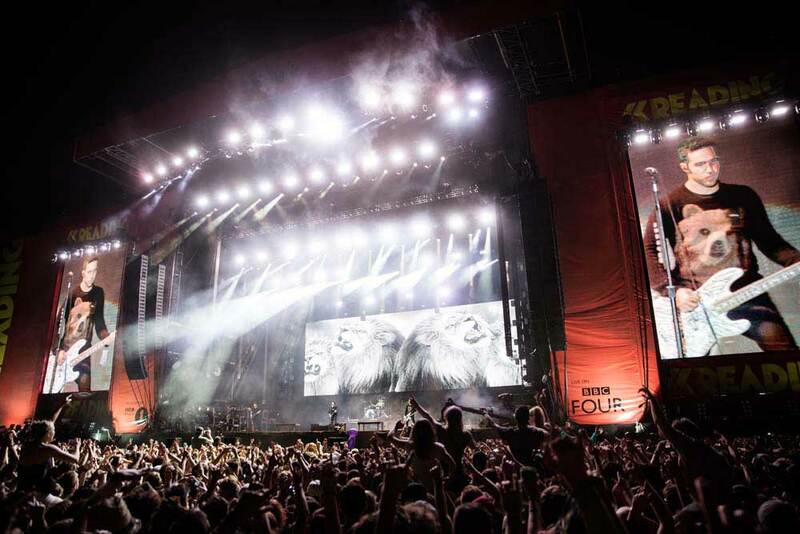 As well as delivering a range of hits on the consecutive nights, the Chicago band created a new show for the festivals, based around their ‘Bloom’ art project, which included a short film. 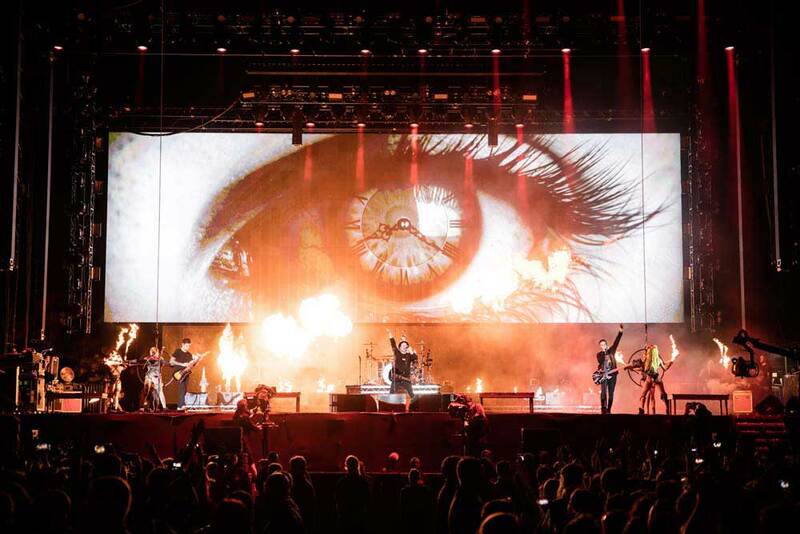 The Jands Vista morphed the FOB tour’s existing programming across a massive lighting system supplied by London’s Neg Earth for the festival dates, mutually agreed upon to suit both the headliners and the festivals. This comprised more than 250 fixtures of Clay Paky Sharpy, Martin MAC Aura XBs and Vipers, Vari*Lite 3500 WFX, SGM Q-7 and Moles. 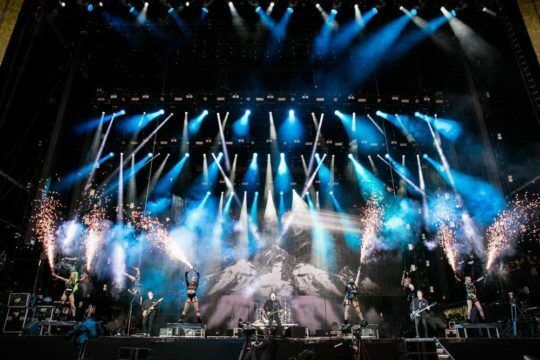 The lighting was tied in with the show’s media content, which included live camera feeds and striking visuals designed by Robb and his creative team of animators. Also touring with the band was a custom-built scenic wall with one 12m x 2.6m side consisting of ROE Vanish 25mm LED panels, and the other of flower walls to match the Bloom project’s design. This extended the video raster down low behind the band, starting in a downstage position and flipping on cue to reveal the floral side, before moving upstage behind the band to mix with the show’s video canvas. Get your personal demonstration of the Jands Vista range at LDI 2016 on the booth of exclusive North American distributor, A.C. Lighting Inc. (#2252).